I thought at first it was a lost fake fur stole. 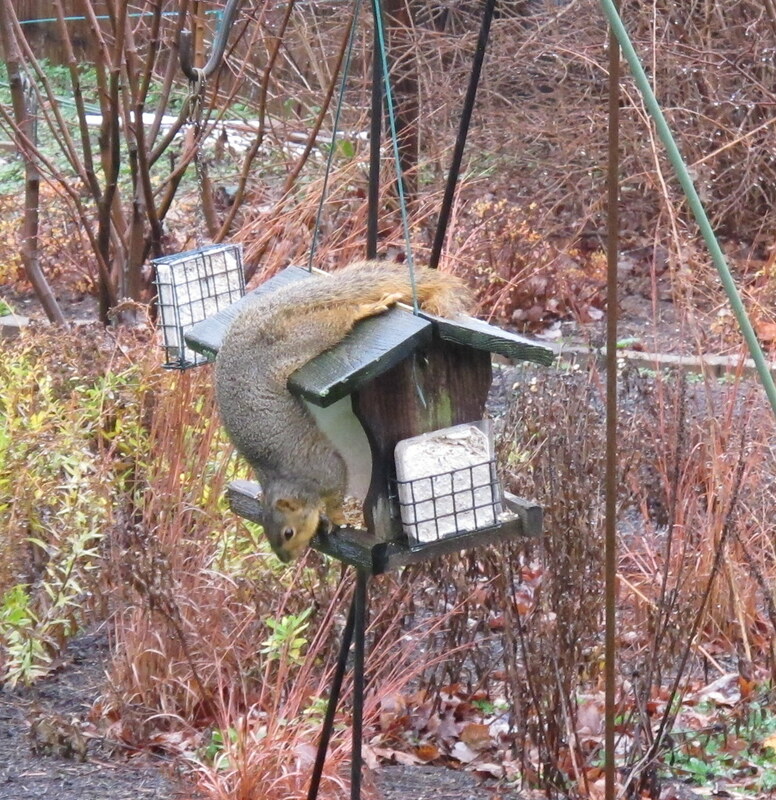 She easily climbed up the shepherd’s crook and draped herself upside down on the feeder to reach the bird seed. She began to gorge herself, for who knows how long, until I opened the door and hollered at her. Then with one jump she was on the ground and sat there looking at me, no doubt waiting for me to leave. I whistled a stern warning, she fled. Then I wrote a poem about her, titled "Squirrel, Who Are You". Why do you eat the bird’s food? What will be left for them when you are done? Who taught you to climb up the pole to the feeder? Where do you hide when I holler at you? How do you explain yourself to the birds? When will you leave my garden? Then I found a poem the squirrel left for me, titled "Carol, Who Are You". Why do you feed the birds? What will you do when I am done eating? Who taught you that squirrels shouldn’t eat from bird feeders? Where do you go after you holler at me? How do you explain your dislike of me? When will you catch on that I am here to stay, especially as long as you feed me? I am not dealing with any ordinary squirrel here. Let the sparring begin, with some ground rules. Please make note of and follow these rules. No digging up bulbs. This is an absolute must-follow rule. No getting on the roof or in the gutters. No babies, no squirrel piercings of any kind, no squirrel tattoos. Leave the birds and rabbits alone, and only eat your share from the bird feeder. Those squirrels are devils, even if they write poetry! That said, I believe you are being too harsh about the tatts and piercings. Her cousins are in my bird feeders! Oh my goodness! Great post today. I've learned that If I slide the hook through a metal slinky, the squirrels can't get to the seed. I found it eerie that the squirrel wrote such a similar poem. Almost like it can read your mind. I'd be careful. Good luck with that...haha. Those squirrels have attitude! Hi Carol: My husband and I gave up trying to keep the squirrels away from the bird feeder, so we took it down and for years have scattered wild bird food and bread on the ground in an area of the backyard surrounded with trees and shrubs in which all the birds can take refuge. This has worked very well - the mourning doves, blue jays, cardinals, red-winged blackbirds, sparrows - and even a woodpecker - happily feast every morning and evening, along with six of the chubbiest squirrels in our neck of the woods. Problem solved! Perhaps your squirrel took his notes from these squirrels? Good luck. We have flown the white squirrel flag at our house; they are always looking plump. I can't believe I'm going to admit this, but...we actually raised two abandoned baby squirrels a few years ago. I know, I know...but as much as I love our gardens, we are suckers for abandoned animals. 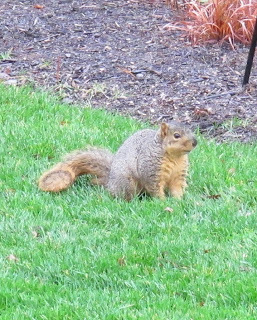 Now, when we see squirrels raiding the bird feeders or biting the heads off my pansies, I quietly fume while the kids are delighted to see their furry friends. oh, lets face it... if we are going all literary, we can sum this up nicely if we resort to bad words: Squirrel, thy name is B*st*rd. I love it... My dogs chase the varmits but never win! I am from Columbus In. Now living in KY but loyal IU fans.